Faith continually evolves. How we understand aspects of our faith today is different from a year ago or five or ten. We grow in insight (cf. Dei Verbum, 8) because our faith is alive in us (not sealed in a box); because the Holy Spirit is at work in every generation; and because our human understanding of God is never be complete. This Lent I experienced one of those new insights: the first reading of the first Sunday of Lent from Genesis (2:7-9; 3:1-7) struck me in a way I had never thought of before. It’s the Garden of Eden story: the devil tempting Eve to eat the forbidden fruit. Usually the story is used to explain the presence of sin in we human beings: Adam and Eve give into temptation, they eat the forbidden fruit and thus we are a fallen people in need of salvation through Jesus. That interpretation or focus is of course valid. But this year I found myself asking: why did God say that fruit was forbidden? Why did God not say go ahead, help yourself, after all it was a good thing? If we widen our focus we come to understand that the reason it was forbidden is not about the fruit itself but about the two trees from which it came; they were reserved to God. God alone could distribute from them. So while the story certainly explains sin, more widely it explains God’s desire to be at work, and remain at work, in the garden of our lives. Some might think that the focus on God’s activity, rather than on our sinfulness, is a softer option. But I think that misses the point. God reserved two trees to himself because Gods’ work among us – as distinct from our good works for each other – is essential. 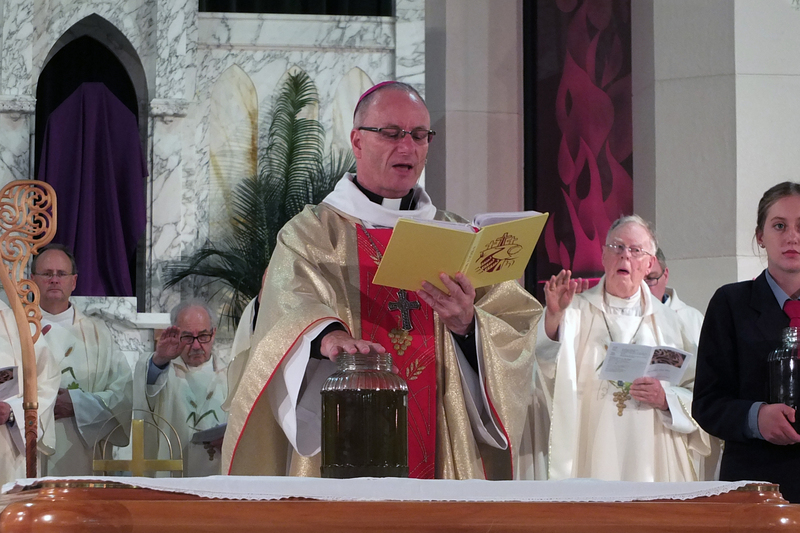 The word liturgy – what we are participating in now – means mahi or work. That may seem a bit odd. But liturgies are the setting for sacraments and our seven sacraments are simply God at work among us: God welcomes us into his family at baptism; God feeds us with his body and blood in the Eucharist; God heals and strengthens us through reconciliation, confirmation and anointing; God joins us in matrimony; and God consecrates us in the priesthood. The two reserved trees in the Garden of Eden are then the forerunners of our sacraments: so, they too – among all the good acts we do as Christians – are what is essential. Everything else is secondary. That is why we are here. The sacred oils which are blessed tonight are the instruments or tools of our mahi as an iwi whakapono or faith community. Their use in our parishes and communities is not optional but essential, defining who we are, because their kaupapa (or purpose and goal) comes from God. Our pastoral work with the oils of the sick, of the catechumens, and of the Chrism shows the world that God is with us, healing the sick, making us well in body, mind and soul, giving us wisdom and strength and understanding and courage, transforming us inwardly so that we may share in eternal life (from the prayers of blessing of the oils). The temptation of Adam and Eve however still lives on in us. Our human condition and our cultural comfort seems to shudder at the thought of anything being essential. We yearn for the good fruit but we want to dispense it ourselves. We are a self-service, DIY, culture. And so therein lies a pastoral challenge which involves us all: to re-awaken within us a sense of the essential, to grow in our understanding and acceptance of God’s humble yet fixed decision to reserve two trees to himself, in other words to notice and embrace God at work among us essentially and primarily (though not exclusively) through the sacraments. Our temptations are not in themselves bad. Think of them – the distractions that pull us away from this mahi, the mahi of Sunday Mass, what are they? Sports practices, coffee, golf, sleep-ins, catching up with friends, walking along the beach; they are all good – part of the wondrous beauty of God’s garden – but none of those is essential; each is secondary. Understanding and keeping and honouring that distinction – between the essential and the secondary – is our greatest pastoral challenge here in Aotearoa NZ at this time. Because, we are tempted to substitute God with good things. Tonight I wish to thank in particular the priests for their work in helping others come to recognise the essential, the kaupapa, the foundation and goal of our Christian lives sourced in the Lord who remains for all time at work among us. To grow our parishes and faith communities I have made the overarching pastoral goal of our diocesan family. Of course it is not my idea; it is Christ’s. Some say it’s too big a hope for today. Things have changed they say. Yet in the consecratory prayer of the Chrism you will hear tonight: “above all, Father, we pray that through your anointing you will grant increase to your Church.” I believe the goal and challenge of growth, and yes numerical increase included, rather than burdening hope keeps it alive. I know too that this hope is shared by parents, and our Principals and DRSs and tagged teachers whom I also thank on this sacred night for their collaboration with and encouragement of our priests. Yes, it’s a hard goal, it’s hard work. Blessed Antonio Rosmini in his six maxims or guides to Christian life said: “direct all one’s thoughts and actions to the increase of the Church of Jesus Christ”; and then in balance added “remain perfectly tranquil as God orders all events, whatever happens, to ourselves and the Church” (Maxims 2 and 3). So often parents say to me: “I just pray for my (adult) children”. It is the angst yet – perhaps surprisingly – also tranquility of a parent’s prayer for his or her children that we priests make our own. Just as parents’ concern for their children is never complete so too our work as priests can never be complete, can never be too much, can never be too demanding. And that is the measure not of burden but of love; how could we settle for anything less? To everyone tonight I say thank you for your presence and witness. To the many young people here – from Cullinane College and St Peter’s College and St Marcellin school and others – can I say your presence encourages and uplifts me. May this sacred liturgy warm the hearts of us all.